a basic thanksgiving feast begins with turkey. Thanksgiving is one of my favorite holidays, mostly because it marks the beginning of the holiday season here in the US! The weather around the end of November is usually cold enough where I crave spicy hot chocolate and pumpkin lattes, and then get into serious cooking mode. For the past few years, Jules and I have been invited to other people’s houses for Thanksgiving, usually just as guests, but last year we cooked a Thanksgiving dinner for 12 people (we bought a pre-brined turkey!) at our friends’ home out in Richmond. 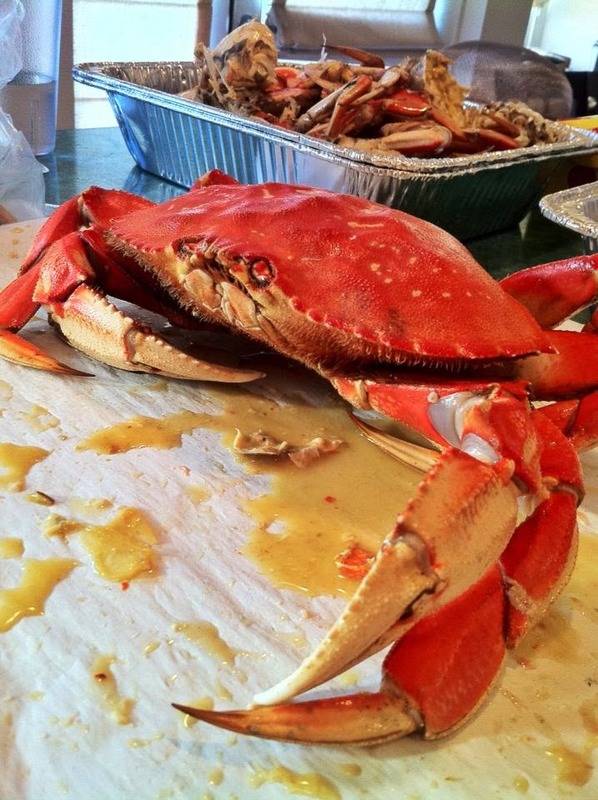 This year, our original plans to cook dinner again fell through and we ended up being invited to our friend’s house in Oakland and partaking in a non-traditional (yet delicious) dinner of crab, roast duck, and an assortment of side dishes. As much as I love to be in the kitchen, I really love when my friends cook for me – especially ones that go all out like our friend Luis does! Well, Jules happens to love turkey with cranberry sauce, so I figured it couldn’t hurt to make a small “traditional” Thanksigiving dinner for the both of us. Besides, leftovers are the best part – I envisioned making a Ross Gellar-style Thanksgiving Sandwich with a slice of gravy-soaked bread in the middle. We found a 7-pound turkey at Whole Foods, and I started brining our bird at around 10:30pm. Brining, as I discovered, is not hard at all. I took a look at a few brining recipes (bravo to those of you who can follow Alton Brown’s recipe – it’s a doozy). Ultimately, I ended up making my own version of brine, and it came out beautifully. In a large stockpot, put in 8 cups of water, salt, sugar, and spices, and bring to a boil. Let boil for about five minutes, and then cool the mixture (I stuck it in the freezer for a little bit). In a vessel big enough to hold your turkey plus brine, add the cooled mixture, and the rest of the ingredients. Be sure that your turkey is fully submerged. Some people recommend flipping the turkey once during the brining process, which I didn’t do, but it certainly can’t hurt! Let the bird marinate for at least 12 hours. Brining is not an exact science, so you can add additional spices, leave some out (i.e. some people don’t like cinnamon on their poultry), brine it for 24-48 hours, etc. It’s really up to you! Once you’re done brining, take the turkey out, rinse it with cold water, and discard the brine. To cook the turkey, I took a cue from Alton Brown. I stuffed the cavity with some aromatics before roasting. Microwave the apple, onion, cinnamon, and water together in a small bowl for 5 minutes. Take the steeped aromatics and stuff into the bird’s cavity. I also added a sprig of rosemary, sage, and a few sprigs of thyme for good measure (I love rosemary & thyme on poultry). Pat the turkey skin dry and then massage with a good dose of olive oil or softened butter – this will help crisp up the skin and give your turkey a beautiful color. Salt and pepper the turkey liberally, and then you are ready to start cooking. Next, put the turkey into a preheated 425 degree oven and roast for 15 minutes, then turn down to 350 and keep roasting until the turkey is cooked. Depending on how large the turkey is, you will want to baste the skin with the drippings every 8-15 minutes. My ~7 lb. 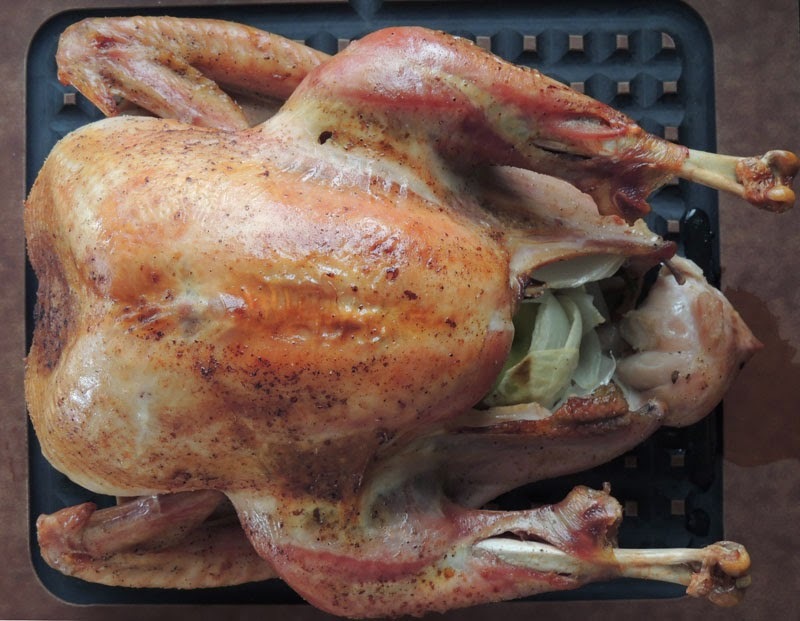 bird was ready in 90 minutes – you will want to calculate 13 minutes per pound. For an in-depth look on the proper way to roast a turkey, click here!